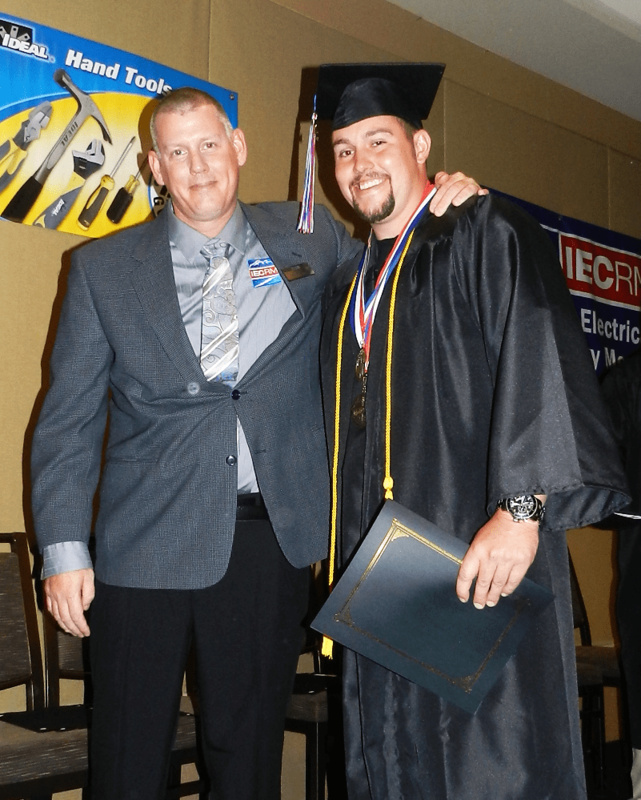 WESTMINSTER, Colorado — June 5, 2014 — On Saturday, May 31st, 51 future electricians graduated from the IECRM Four-Year Electrical Apprentice Program at a special graduation ceremony at the Westin in Westminster, Colorado. An audience of more than 300 family members and friends, spouses, instructors, employers, and staff attended the event. The graduation ceremony and student gifts were generously sponsored by IDEAL Industries and Milwaukee Tool. IECRM graduates are unique in that they have accomplished academic as well as career achievements while pursuing a higher education. An overwhelming majority of IECRM students work full-time as electrician’s apprentices while they complete their education at IECRM. IECRM alumni includes: business owners, Master Electricians, a member of the State Electrical Board, C-Level executives, IECRM instructors, and many more accomplished tradesmen. 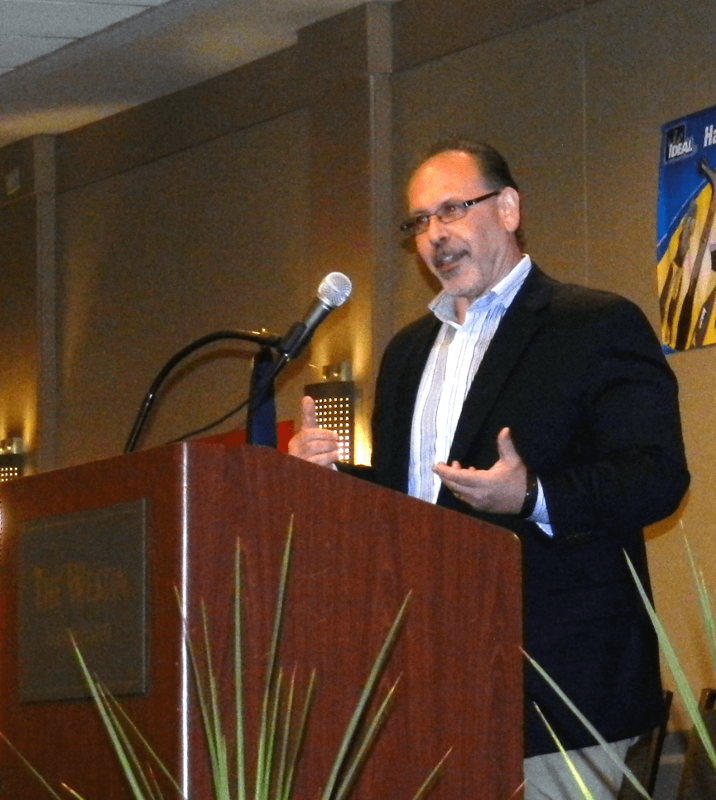 Keynote Speaker at the graduation ceremony was Mike Epstein (pictured below), a past cast member of ABC’s Extreme Weight Loss television show. During the ceremony, several graduates and underclassmen were awarded for achieving high academic honors, perfect attendance, competing in the 2014 Wire-Off Competition, and other achievements. Several IECRM instructors received gifts of gratitude for their 5, 10, or 15 years of dedication to teaching IECRM students. Every graduate received a 10-piece IDEAL Industries toolkit as a graduation gift. All gifts were generously donated by IDEAL Industries, Inc. and Milwaukee Tool. Registration for the next session of the Four-Year Electrical Apprentice Program opens on June 23, 2014, followed by an Energy Industry Job Fair on June 24th. Sign up here to attend the job fair or visit www.iecrm.org for more information about the Four-Year Electrical Apprentice Program.